An online newspaper article practically caused The Legal Genealogist to fall off her chair yesterday: it may be — just possibly — that a politician is keeping his word. At least mostly. So what does Governor Deal’s budget plan mean? It means we — all of us in the genealogical community — have more work to do. Because, despite the Governor’s last name, this isn’t a done deal. It requires action by the Legislature to approve the budget. And the Friends of Georgia Archives & History and others are pushing hard for an additional $1.3 million to reopen the Archives five days a week instead of two and, perhaps, to restore some of the staff positions that have been lost. It requires action by the Legislature to authorize the transfer of the Archives to the University System, where it will be safer (not entirely safe, but safer) from the vagaries of politics in its funding. So each and every one of us who cares about records access — especially but not just those of us with Georgia ancestors — needs to stay on top of this fight. 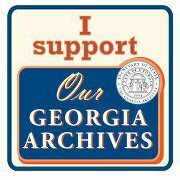 Join the Friends of Georgia Archives & History. Read about developments on its website, at GeorgiaArchivesMatters, and on the website of the Society of Georgia Archivists. As noted by Friends of Georgia Archives & History, “It is critical that at least one person, preferably one of their constituents, contact every senator and representative in the state to encourage them to support the Governor’s recommendation that the Archives move from the Secretary of State to the University System of Georgia and to support an increase in the Archives budget. The ideal budget increase is $1.15 million.” Contact information and talking points can be found at the FOGAH website. If you’re a Georgia resident, write to your own representatives. If you’re not, but you have Georgia ancestors, write to the representatives for the areas where your ancestors lived — where you might also visit on a trip to the Archives. It’s up to us. Let’s work together on behalf of the Georgia Archives. Thank you for this rallying cry and for this information. Not knowing how the members of the Georgia Legislature line up politically, it’s hard to make any predictions of whether so-called “austerity” panic will influence them. But I do know that legislatures are perilous places. You are certainly right, I believe, that the problem has not been solved yet and that it’s up to the people to keep up the “public outcry.” Sometimes being a responsible citizen seems like a full-time job! It is a full-time job, Mariann. And we’re the only ones who can do it!